The bull market continued on its way during November with the S&P 500 gaining 2.81% for the month. While I'd prefer to see lower prices if I was buying, I can't say my net worth is disappointed with this bull run in the least. November's move higher boosted my assets across the $700k mark which I can honestly say I didn't see coming at this time last year. During November alone my net worth increased $19,086.47. 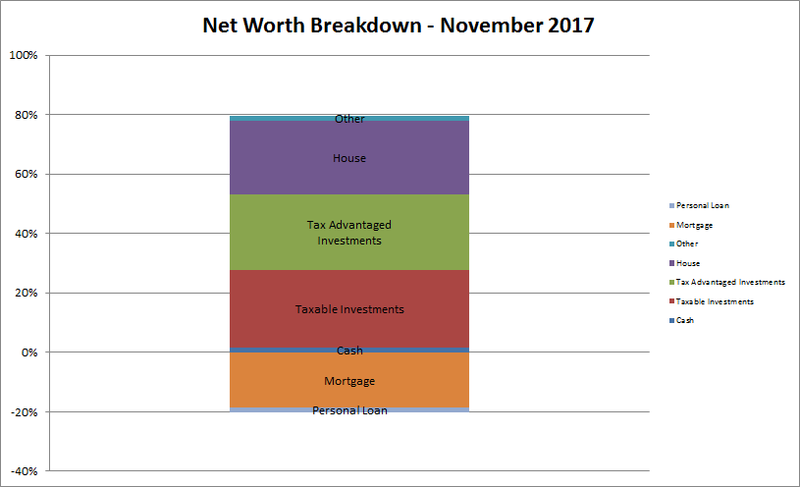 My net worth increased 3.8% during November and has climbed over 11.4% YTD. 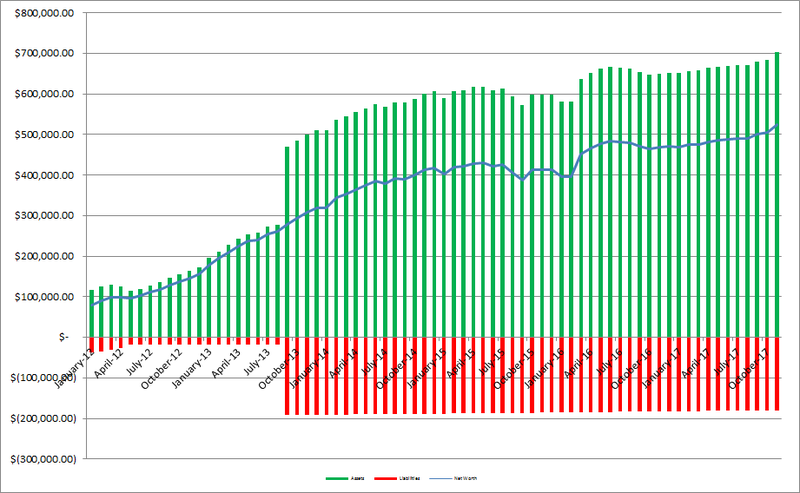 As of the end of November we have 25.6% equity in our house based on our purchase price from 2013. However, according to Zillow our house has increased in value just over $32k from our purchase price which is a nice bonus, although I keep the purchase price as the value in the net worth equations. Based on Zillow's estimate the equity in our house is 35.2% thanks to the appreciation. Since I write so much about investigating companies as an investment I figured it'd be fun to see how our balance sheet looks. As of the end of November our debt to equity ratio is 34% and our debt to total capitalization is 20%. Not bad, but I'd love to get that debt down to ZERO! Truly passive income, dividends and interest, totaled $263.98 during November which was about a $22 decrease from August. Although there was a decline it was just due to the timing of dividend payments. *Dividends are from my taxable accounts only. With my writing taking a back seat the past few months the EBIT from blogging/writing was a big, fat ZERO for November. So total non-day job income for November stayed at $263.98. YTD I've received $6,129.19 in non-day job income. What a great set of milestones you achieved! Yeah, the bull market was a great tailwind I guess for all of us. On the other side, it makes new stock acquisitions more and more expensive and risky. I keep some additional cash (maybe even too much) to take profit when the markets dive. 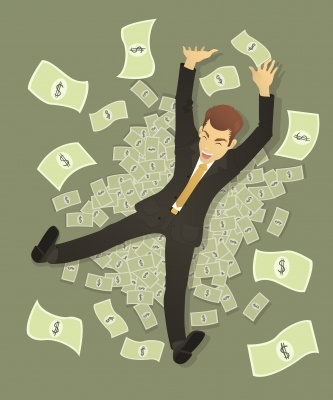 And after all, what really matters is a growing passive income stream. Keep up your great work and all the best! As FV noted below I didn't even notice that we crossed the $250k liquid assets level either which is pretty cool to see. That's just taxable accounts and cash which I think is pretty awesome. Congrats on being over these milestones. What a strong push to the finish line for the year. December is looking positive already, pumped to read! It's pretty awesome to reach some big round number milestones. As long as the markets don't get the yips next week then we should end up very nicely for 2017. I hope that 2018 is even better although I don't expect as much progress on the net worth front, surely the markets won't have a big run again, and we'll also be focusing on some debt pay down for 1Q and maybe 2Q. But overall we'll be in much better shape than we started and that's all I can ask for. The 1/4 MM liquid networth is quite tidy. You are well on your way! Damn, I didn't even catch that. $250k liquid, $500k net and $700k in assets. All of those were milestones passed over the last 2 months. Awesome progress on all fronts, PIP. I especially love the upward trend on the net worth chart. Things should really start ramping up after getting cash flow positive by such a healthy margin again. Continued success to you as we get ready to enter 2018! There's been some minor blips from time to time, but for the most part it's steady and consistent progress. Getting back to cash flow positive, not counting extra debt payments, is key. I'm glad to finally be back at those levels so we can knock out the non-mortgage debt that we have. I can't wait to get back to investing my capital each month or at least having the choice of what to do with it. It's pretty awesome to get to 500k - i'm right near there right now myself buddy! The graph looks good and you're well on your way to get that debt load off your shoulders eventually. Throw a couple extra payments at it here and there and it'll be gone before you know it! It's pretty cool to pass that $500k level. That's a huge milestone and we're well on our way towards $1M. Most of our debt is our mortgage, but there's some small-ish debts floating around that we really need to just get cleared off our books.